Gorton Heating Corporation is the manufacturer of the renowned Gorton fast venting valves. We have a wide selection for any radiator, which means maximum comfort at minimum fuel cost to you! 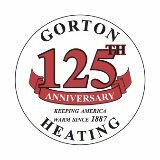 For over 127 years, Gorton Heating Corporation has been manufacturing innovative and dependable steam heating equipment. Plumbing contractors have made Gorton their #1 choice and are assured of installing the finest and fastest venting air valves produced. Over two million radiators can't be wrong. Make Gorton your #1 choice. The only call back you will receive is for more business. There is a Gorton valve for every steam heating system.